Persepolis is an ancient city that once served as the capital of the mighty Achaemenid Empire. Persepolis is the Greek name for ‘Parsa’, and both these names mean ‘Persian City’ or ‘City of the Persians’. This city was founded by Darius I (known also as Darius the Great), and construction of this capital began towards the end of the 6 th century BC. The building work continued well beyond the lifetime of Darius by his successors. For instance, certain buildings are known to have been built during the reigns of Xerxes I and Artaxerxes III. Persepolis was infamously sacked, looted, and then destroyed by a conflagration following its capture by Alexander the Great. In 518 BC, Darius began the construction of Persepolis, the new capital of the Achaemenid Empire. The site chosen for this grand project was the foot of the Kuh-e Rahmat (translated as ‘Mountain of Mercy’), which is situated in the southern Iranian Fars Province. It has been pointed out that due to its remote location, Persepolis was almost inaccessible during the winter, as the rains would turn the paths leading to the city into mud. Therefore, Persepolis was only used during the warmer months, whilst the empire was administered from other cities during the winter. Terraces were built upwards from the River Pulwar, culminating in a platform covering an area of 450 meters by 300 meters (1476 ft by 984 ft). On this platform, Darius built the first palace, which was completed in 515 BC. In addition, the construction of the Grand Stairway (known also as the ‘Stairs of All Nations’) was concluded that year. This stairway, which is located at the north-western part of the platform, is one of the city’s monuments that has survived till today. The Grand Stairway is particularly notable for its reliefs, which, amongst other things, depict the various nations under the rule of the Achaemenid Empire. Another Achaemenid ruler who contributed to the built landscape of Persepolis was Darius’ immediate successor, Xerxes I. The Gate of All Nations, the Hall of a Hundred Columns (this building was only completed during the reign of Xerxes’ successor, Artaxerxes I), and the Palace of Xerxes were built during his reign. The palace that Xerxes built was twice the size of that of his predecessor, and was connected to it by a terrace. It has been observed that, compared to Darius’ palace, the palace of Xerxes has been more severely damaged. One plausible explanation for this is that the Macedonians who razed Persepolis paid special attention to this building. Xerxes, it might be reminded, was the king who ordered the sacking of Athens in 480 BC. Subsequent Achaemenid kings initiated their own building projects in Persepolis, and built upon the work of their predecessors. 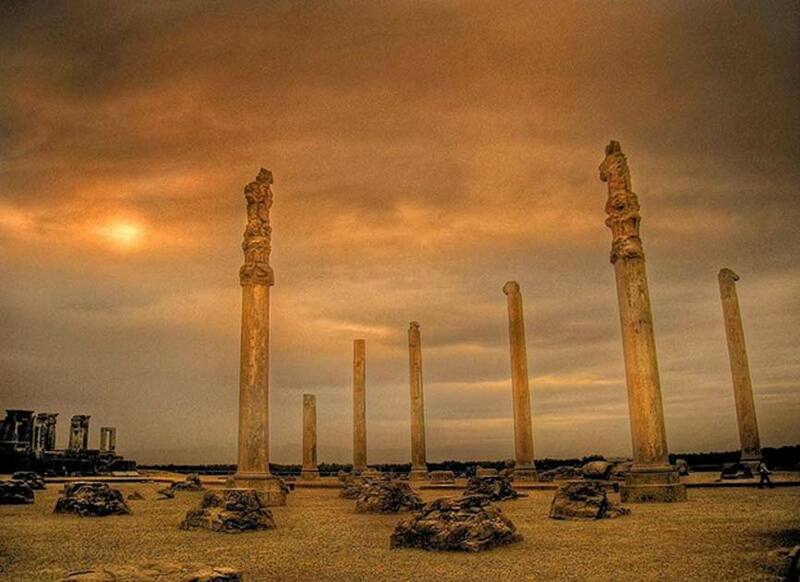 In the spring of 330 BC, Persepolis fell to the army of Alexander the Great. It was here that the Macedonian king did one of the most infamous deeds of his life. Before leaving the Persian capital, he had it looted and burnt to the ground. The exact reason for Alexander to commit this atrocity is considered to be one of history’s great mysteries, and conflicting explanations have been given. In general, the ancient authors place the blame chiefly on the head of an Athenian hetaerae by the name of Thaïs. The accounts of Diodorus Siculus, Quintus Rufus Curtius and Plutarch state that it was during a drinking party that Thaïs made a speech which instigated the burning of Persepolis. Another ancient author, Arrian, mentions that the fire was deliberately started by Alexander as revenge for the Persian sack of Athens. Furthermore, this was done in a sober state of mind, as Arrian’s sources did not mention anything about a drinking party, hence the assumption that this had not taken place. Nevertheless, Arrian himself acknowledges that conflicting accounts have been given by men who were first-hand witnesses of the campaign, and should therefore be familiar with its events. Hence, Arrian admits that we may never know for sure the real reason for Alexander’s destruction of Persepolis. ... Alexander had just experienced one of the most harrowing events of his career at the Battle of the Persian Gates. He had to cross a narrow mountain pass in enemy territory and race towards Persepolis before any potential Persians could get to it. So, he ordered a large body of his army into pass deep into potentially enemy held territory and did so without sending a reconnaissance force ahead. For all his military genius, this was incredibly foolhardy and naive on Alexander's part. He led his troops right into the perfect ambush. Entire platoons of his men perished and had no choice but to retreat, leaving the bodies of his fallen soldiers behind with no proper burial. For about a month he pondered his next move and conveniently a local tribes told him of alternative route. He then outflanked the Persian resistance and finally won his army safe passage. Persepolis was his for the taking. And, the primary reason he wanted Persepolis was it's treasury. Perhaps, the largest treasury in the world. But, as he rode to the city he encountered a gruesome sight. According to sources, 800 mutilated Greek slaves awaited him outside the city. What must have he been thinking when he saw these poor defenseless Greeks. His army proceeded to pilage and loot the city with no second thoughts. Persepolis was the cultural/spiritual/political capitol of Persia. If any city was the target of King Philip's Persian Invasion, it was Persepolis. Xerxes himself had a palace here. But, Persepolis was also the most exotic and beautiful city in Persia. It was Alexander's property now. King Philip said he wanted to invade Persia to liberate Persian controlled Greek cities in Asia and avenge Athens. But, deep down, Philip wanted Persian gold. And, now Alexander had it. But, Alexander also had a personal hatred of Zoroastrianism. He had the money so burning down the city was no big deal anyway. And after one night of partying, a fire broke out and burned down a significant part of city. And, Alexander, with sources, was regretful. He was even chastised by his elders for such a senseless act. I don't believe he had any such plans for burning the city after he entered into it. But, I believe the previous frustrations and binge drinking led to a spontaneous act of destruction. Persepolis is now lost to history. The art, the architecture, the knowledge is now gone. It is even said he tried to put the fire out but was too late. But, he would have more cities to conquer, more Alexandria's to found, more of Persia to take. Darius was still at large and the the Eastern Sea was yet to be discovered. But, the destruction of Persepolis would cement him as far as any Persian is concerned, as Alexander the Accursed.